On my travels around the Northern Hemisphere last autumn, I had the benefit of three faithful companions: three bags that between them carried all my gear. They were on their last legs even then – their ratty appearance, I suspect, had something to do with the fact that I didn’t once face anyone trying to steal from me – and now the last of them has been replaced. Seems like a good time to reflect on them. 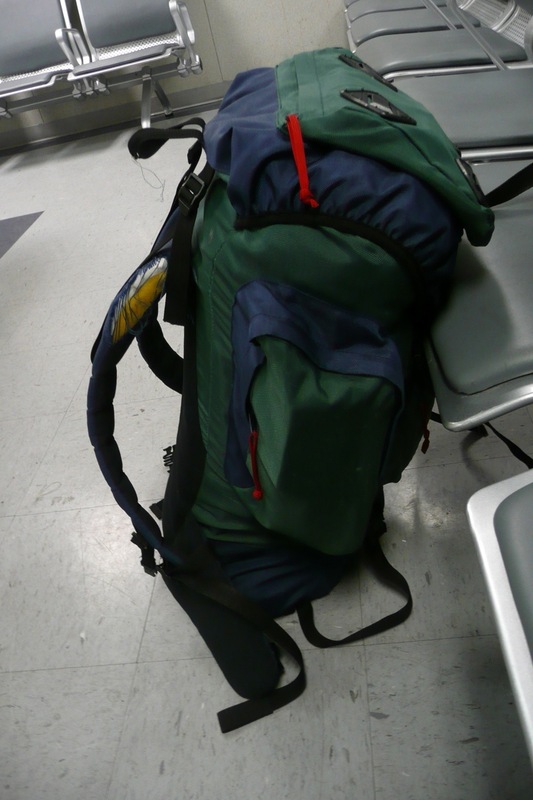 The biggest of them, pictured above, was a mid-sized rucksack. It was also the oldest, originally purchased for a skiing trip when I was around sixteen, meaning that it was with me for something close to twenty years. Too unwieldy for short trips, it accompanied me whenever I was going somewhere for a week or more, meaning that it was with me on my most memorable journeys. Its waterproof inner coating was already coming off in sheets at the start of my round-the-world trip, and by the end one of its shoulder straps was hanging on by a thread. However, it went out in a blaze of glory, from Irkutsk to Vladivostok and on to Walden Pond. My sports/shoulder bag, a black Nike sack, wasn’t quite as old – I bought it around the time I started college – but it was a far more regular companion, seeing use day in and day out for much more than a decade. Quite how it survived all the wear and tear, I don’t know, but it wore down slowly rather than gave way suddenly, and I used it long after it had ceased to look respectable. A hole in a side pocket led to a few lost coins and the right shoulder strap was more of a string by the end, but it was still useful right up until the end. Much less of a traveller than the rucksack, it proved a much more convenient store for everything I didn’t like letting out of arm’s reach as I headed in search of the rising sun. The smallest of the three bags was a washbag. When I got it, I don’t remember, but I do remember how: it had lain unused in my parents’ house and I nabbed it for a trip somewhere. Ever since then, it accompanied me on every journey, long or short, full of all the toiletries that kids don’t seem to need but adults do. Nothing more than a pouch with a zip and some internal pockets, it was replaced yesterday by a bigger, fussier-looking alternative, which currently sits half-empty in a bigger bag, ready for a trip home. Three bags, long-used and redolent with memories. All gone now. That’s the way of things. We can hang onto items longer than we should, spurning better alternatives because of the memories that they accrue over years of use. Not the best of ideas. I’m a partial fan of the idea of a de-cluttered life, but my main argument in favour of letting things go is that separating the memories from the things is a good step. Learning to let go of things takes you halfway to allowing your memories to release their hold on you.